The country no longer wants to remain a blank spot on the global tourism map and is taking a new approach to hosting foreign guests. In 1985 – the year perestroika began – some 6 million foreigners visited the Soviet Union, although many of them came from Eastern Bloc states, had few other travel destinations to choose from, and often travelled for free on vouchers from various trade unions. Since the dramatic drop in this type of tourist in the 1990s, Russia has been unable to draw even close to number of visitors seen in the Soviet era. In 2009, the number of tourists visiting the country barely topped 2 million – about the same level as in 1970. 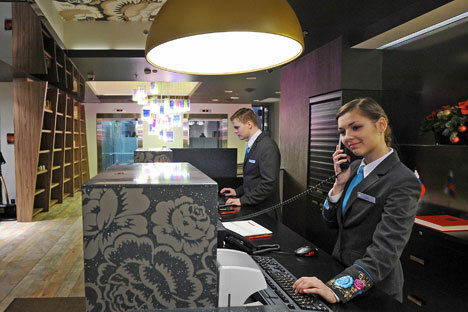 Official statistics show that 2.4 million people visited Russian in 2010, but privately, travel agents are skeptical. They estimate that the number of tourists is really between 500,000 and 1.2 million, while the rest are visiting the country on tourist visas but traveling for other reasons. Yet they remain optimistic. Nikolai Kakora, the deputy general director of Intourist – the ubiquitous Soviet travel agency that is now part of a joint venture with the UK’s Thomas Cook – believes that the number of foreign tourists may rise by another 5-10 percent in 2011. Kakora maintains his positive view even despite a difficult winter and spring for tourists in Russia and the market as a whole – such as the terrorist attack in the arrivals hall of Moscow’s Domodedovo airport, the turmoil in the Middle East and the earthquake in Japan. “After the recent earthquake in Japan, many Japanese tourists cancelled their trips to Russia, and we expect a 25 percent drop in the number of visitors from the country as a result,” Kakora explained. But Europe is responsible for most of Russia’s tourist traffic, although the share of Asian countries is also gradually rising. “The tourist flow from Latin America, especially Brazil, Argentina and Chile, is also increasing, and it’s obvious why: Citizens of these countries have been granted visa-free travel to Russia,” Sergei Voitovich said. Maria Levchenko, general director of Tari Tour, agrees that 2011 should be a good one for travel to Russia. “This year we will see a slight tourism boom in Russia. The tourist season started half a month earlier than usual, and we expect a 30 percent rise in foreign tourists,” she said. Russia has recently been frequently referred to as a blank spot on the global tourism map. At the World Economic Forum in March, experts ranked travel markets based on their competitive ability. Russia was ranked 91st in investment in the industry’s development. But when the rankings were made based on such characteristics as the availability of top-level natural and cultural tourist attractions, Russia made the top 10. Nikolai Kakora thinks that foreign tourists so far have no sustained interest in Russia. “People tend to come to the most popular countries several times, while they visit Russia only once.” And among those who come, only Moscow, St. Petersburg and maybe the Golden Ring cities are tourist destinations. Only a limited number of tourists visit other places of interest. Even so, experts do not agree that Russia is a “blank spot.” Voitovich believes that both Moscow and St Petersburg – the destination for 90 percent of foreign tourists coming to Russia – have sufficient infrastructure. “There are all kinds of hotels, and you can always find a room. There are enough tour guides, restaurants and sightseeing buses, and although not all the services are high quality, the situation is improving fast,” he said. Maria Levchenko also thinks that that Russia’s two biggest cities now have better 3-4 star hotels offering reasonable prices, and the product range is changing now that major international hotel chains, known for paying particular attention to service, have come to the market. “I would not call this a blank spot,” Levchenko said. Additionally, the Moscow authorities recently announced plans to create electronic city tourist guides for iPad, iPhone and other communicators. “If we look at Rosstat’s (Federal State Statistics Service) findings, tourists are mostly unhappy with transport and hotel prices. Moscow also lacks some amenities typical of other megalopolises: street signs in the Latin alphabet, tour bus parking spaces in the city center, public toilets. “We are working in all areas,” said Sergei Shpilko, chairman of the Moscow Tourism Committee, in an interview with Rossiyskaya Gazeta. He went on to say that a call center for tourists will be opened in July, while street signs are currently being updated. Over 30 tourist maps have been set up in the city’s main tourist destinations. Stops and parking areas for sightseeing buses in the city center are also being developed. “The 2018 World Cup must also serve to introduce Moscow as a modern tourist hub drawing in millions of visitors from around the world,” Shpilko said. Meanwhile, the Russian visa system is becoming more favorable to foreign travelers. Voitovich said that a law has been adopted allowing tourists to St. Petersburg arriving on cruise ships and ferries to stay for up to 72 hours without a visa. As a result, Russia has seen a large increase in cruise tourist traffic, and ferries from the city to Stockholm, Sweden and Helsinki, Finland have resumed operation. Russia is now included in mixed tours called “Russia plus the Baltics” and “Russia plus Scandinavia,” with a week allocated for sightseeing in Russia. In the mid-2000s, the Caucasus re-emerged as a popular tourist destination, although for a short period of time. Levchenko says the region mostly attracted foreigners interested in sport tourism. Russia’s North Caucasus boasts one of the most beautiful and highest mountains in Europe, Mt. Elbrus, which is popular with downhill skiers and mountain climbers, but the murder of several tourists by terrorists in the region this winter has caused foreigners to lose interest in Elbrus. Levchenko said experts do not expect the area to be a destination again for three to four years. In 2010, Russian President Dmitry Medvedev released a project for building five downhill ski resorts in the five republics of the North Caucasus – Adygeya, Kabardino-Balkaria, Karachaevo-Cherkerssia, North Ossetia and Dagestan – worth a total of 451 billion rubles (roughly $15 million). The tourism cluster will then be further expanded with new beach and spa resorts, which will require a twofold increase in the planned private investment – up to 783 billion rubles ($28 billion). A beach resort in Dagestan stretching between Makhachkala and Derbent is slated to become one of the largest ones, according to a report by RIA Novosti. The new cluster may become part of a single recreation space on the Caspian Sea, along with resorts that are already being built in neighbouring Azerbaijan. Another cluster will unite therapeautic health resorts around Mineralnye Vody in the Caucasus to resemble Karlovy Vary in the Czech Republic, Kommersant reported. According to RIA Novosti, French President Nicolas Sarkozy and Medvedev agreed to make the North Caucasus tourism cluster project one of the top priorities for the two countries’ strategic partnership.